My Acount is bloked and i dont know why. I just have this acounte but the RS Center say that i used another and is impossible. This message appears although it is not the cause of the problem. 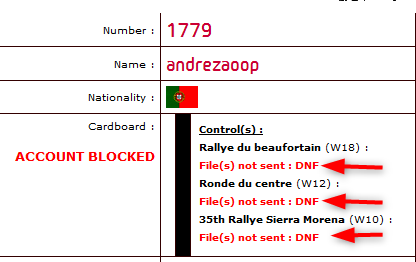 Three times you did not respond to the commissioners' requests by sending the control files (Request by email and on your home page of the live). You have received a BLACK card, your account is blocked until the end of the 2018 championship.